Touched by an Angel is an American supernatural drama series that premiered on CBS on September 21, 1994, and ran for 211 episodes and nine seasons until its conclusion on April 27, 2003. 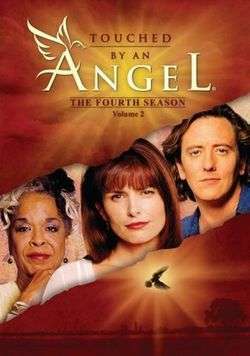 Created by John Masius and produced by Martha Williamson, the series stars Roma Downey, as an angel named Monica, and Della Reese, as her supervisor Tess. Throughout the series, Monica is tasked with bringing guidance and messages from God to various people who are at a crossroads in their lives. From season three on, they are frequently joined by Andrew (John Dye), the angel of death (who first appeared as a recurring character in season two). The series went into syndication in 1998, and has been shown on Ion Television (formerly PAX-TV), Hallmark Channel, and Up. The episodes of the series generally revolved around the "cases" of Monica (played by Roma Downey), a young angel recently promoted from the "search and rescue" division, who works under the guidance of Tess (played by Della Reese), a sarcastic boss who showed greater respect as an authority figure of her employee. Monica in one episode outlines that she started in the choir then annunciations, followed by search and rescue and then case work. Most cases involve a single person or a group of people who are at a crossroad in their lives and facing a large problem or tough decision. Monica and Tess bring them messages of hope from God and help give them guidance towards making their decision. During their first episode, the pair receive a red 1972 Cadillac Eldorado convertible as a gift; they use it for transportation throughout the rest of the series while in the human world, with Tess doing the driving. As the series progresses, Monica continues gaining experience as a case worker and, during some cases having to learn lessons of her own. During season seven, a new angel, Gloria, is sent by God during one of Monica's assignments, who becomes a regular character for seasons eight and nine, as a trainee under Monica and Tess's guidance. In the series finale, Monica is up for promotion to supervisor, pending the outcome of a difficult case in which she must defend Zack (Scott Bairstow), an innocent drifter accused of causing a boiler explosion at a school two years ago in the small town of Ascension, Colorado. The explosion killed most of the children, leaving the citizens devastated. During the case, Monica sees many familiar faces, including Joey Machulis (Paul Wittenburg), one of Monica's previous assignments who is a witness to the events, his brother Wayne (Randy Travis), who is now sheriff, Sophie (Marion Ross), a formerly homeless acquaintance, and Mike (Patrick Duffy), a lawyer Monica saved during her search and rescue days who is now the Mayor. An out of town developer claims Zack is the perpetrator and despite the lack of evidence, Zack is put on trial. Monica does all she can to help him, including asking Mike to represent him, but the prosecutor in the case, Jones, is really Satan in disguise, and Zack is eventually convicted. After the trial, Monica is able to help the citizens realize their mistake and to see that Zack's return to the town had helped them finally start living again. They begin going back to church, welcomed by the pastor they had once abandoned. Their change of heart, however, cannot free Zack, so Monica visits him in jail and reveals that she is an angel. She then promises him that she will become his guardian angel, forgoing all future assignments and the coveted promotion, to protect him from harm in prison. When she returns in the morning, however, the cell is empty. The citizens decide not to search for him, and it is revealed that Joey inadvertently caused the explosion after the devil tricked him into turning the boiler too high to warm some kittens he'd found. The perplexed Monica returns to the desert to find Tess and Zack. There, she learns that Zack was actually God, and that her defending him was a test, which she passed by being willing to sacrifice herself for him. Monica is promoted to supervisor. As she leaves, she says her goodbyes to Gloria, and to Andrew, who gives her a pocket watch to remember their friendship by. Before parting, Tess gives Monica the keys to the Cadillac, as she is leaving her job to sit at God's feet. Monica is last shown driving away as the camera pans out over the desert. Roma Downey as Monica (appearing in 209 episodes), a soft kindhearted angel who is sent town-to-town to encourage people. She's the show's main protagonist. Della Reese as Tess (also appearing in 209 episodes), a tough and sarcastic, but loving supervisor who plays a key role in every one of Monica's cases. She's also the show main protagonist. John Dye as Andrew (1996–2003, 188 episodes), known as "an angel of death"
Valerie Bertinelli as Gloria (2001–03, 46 episodes, guest stars in two season seven episodes), an accident prone intelligent angel made to understand the way of life in the 21st century. Touched by an Angel was produced by CBS and Moon Water Productions. Most episodes of the series were produced in Salt Lake City, Utah. According to New York Times reviewer Caryn James, John Masius created the first pilot episode for the series, but it was a darker, less hopeful story than the producers wanted. It cost the studio $2 million to produce the episode. Masius wrote the show as a reflection of his spiritual anger at the time at his two children being born disabled. Martha Williamson was approached to be the series executive producer in early 1994. She described the pilot she received as "upsetting" as it "portrayed angels as recycled dead people with power over life and death". She initially declined the position, but during a lunch with Andy Hill, then President of CBS, she mentioned the show and suggested he find a producer who would create a show with "loving, joyful" angels that the audience would have to believe in. Williamson stated that she could not stop thinking about the show after that meeting, and eventually called to ask if the position was still open. Though getting the position was no longer a sure thing, she passed up a more lucrative position directing a court drama and went in for an interview with CBS in June 1994. During her interview, she states she emphasized that she was a Christian and could only do a show that depicted angels in a way she felt was true to her view of angels and that was respectful towards God. She also indicated that the pilot should be redone from the beginning, keeping only the characters Monica and Tess, reworked. The studio agreed with her remarks and hired her. Williamson herself wrote a new script for the pilot episode, while also working on hiring the remaining staff for the series, which was due to premiere in September. The pilot was filmed in Salt Lake City, Utah and the show was ready on schedule. The first episode aired on September 14, 1994. The lyrics to the show's inspirational theme song, "Walk With You", are sung at the beginning of each episode by Della Reese. In 1996, Promised Land was launched as a spin-off series, following the Greene family whom Monica had met during one of her cases, as they travel the United States helping those in need. Four crossover episodes aired during Promised Land's three-season run. The series was nominated for eleven Primetime Emmy Awards between 1997 and 2000, including two nominations each for Downey and Reese in the Outstanding Lead Actress in a Drama Series and Outstanding Supporting Actress in a Drama Series categories, respectively. It was also nominated for three Golden Globe Awards, two in 1998 and 1999 for Downey for Best Performance by an Actress in a TV-Series - Drama, and one in 1998 for Reese for Best Performance by an Actress in a Supporting Role in a Series. Though the series was never able to secure either award, Reese did bring it six Image Awards from 1996 to 2002 for Outstanding Actress in a Drama Series; the series itself was awarded Outstanding Drama Series in 1998, 1999, and 2000. Marc Lichtman was awarded five BMI Film and Television Awards for "Television Music" in 1997, 1998, 1999, 2000, and 2001 for his work as the series composer. Touched by an Angel became one of CBS's highest-rated series during season three and continued through season six, when it was the ninth most watched network series, with 17,190,000 viewers that amounted to a 15% share of the market as determined by Nielsen Media Research. In season eight, after the series moved from its Sunday time slot to a Saturday one, it dropped to 79th place, with 8.3 million viewers. A book on the series, Touched by an Angel, was published by Zondervan in November 1997. Written by Williams and Robin Sheets, it contains background information on some of the stories featured, series production information, basic details on the first fifty episodes and profiles of Downey, Reese and Dye. It also has short story versions of four episodes: "Interview with an Angel", "There, but for the Grace of God", "An Unexpected Snow" and "Jacob's Ladder". A second book, In the Words of Angels: Twenty Inspiring Stories from Touched By an Angel, was published by Fireside Books on August 28, 2001. Also written by Williams, it collects twenty short stories based on episodes from the series. An audio soundtrack, Touched by an Angel: The Album, was released on November 3, 1998. The 15-track CD includes a full-length version of the series theme song, "Walk With You", performed by Della Reese and songs by Céline Dion, Shawn Colvin, Bob Dylan, Faith Hill, Martina McBride, Amy Grant, Jaci Velasquez, The Kinleys, Wynonna and Amanda Marshall. The soundtrack went platinum. A second album, Touched by an Angel: Christmas Album, was released on November 9, 1999 with 13 tracks of Christmas music. In addition to having tracks performed by Reese and Romey, it features songs from Randy Travis, Keb' Mo', Charlotte Church, Kirk Franklin, Collin Raye, Amy Grant and Donna Summer. Both albums were released by Sony Music Entertainment, the successor to the former record division of CBS. CBS DVD (distributed by Paramount) has released all nine seasons on DVD in Region 1. Seasons 1, 2, 5-9 were released as single season box sets, while seasons 3 & 4 were released as two volume sets. On February 9, 2016, CBS DVD released Touched by an Angel: The Complete Series on DVD in Region 1. Four themed sets, each containing four episodes, have also been released. The first two, "The Inspiration Collection: Holiday" and "The Inspiration Collection: Hope" were released on November 10, 2009; "The Inspiration Collection: Faith" and "The Inspiration Collection: Love" were released January 26, 2010. In Region 4, Shock Records has released five volumes of episodes from the series, each containing nine episodes and a set containing all five volumes together. Highway to Heaven - Similar concept. Quantum Leap - Similar concept with science-fiction, historical overtones. ↑ "Frequently Asked Questions". Touched.com. CBS. Retrieved March 22, 2010. ↑ James, Caryn (January 8, 1999). "Sure, Mom May Be Dead, But That Won't Stop Her". New York Times. Retrieved March 22, 2010. ↑ Elber, Lynn. "Teenager turns reluctant grim reaper in Showtime's 'Dead Like Me'". Online Athens. Retrieved 21 February 2013. 1 2 3 Williamson, Martha (1996). "TV Is Touched by an Angel". Guideposts, as reprinted at Touched.Net. CBS. Retrieved March 23, 2010. ↑ Sowa, Carol Baass (February 12, 2010). "Martha Williamson and 'Touched by An Angel' still touching lives". satodayscatholic.com. Retrieved March 26, 2010. ↑ Martin, Deanna L. (September 12, 1997). "Emmy Which Way". Entertainment Weekly (396). ↑ "Nominations for the 55th Golden Globe Awards". BBC. January 17, 1998. Retrieved March 26, 2010. ↑ "On the way to Oscar, Golden Globes will offer hints". CNN. January 22, 1999. Retrieved March 26, 2010. ↑ "Patrick Williams Earns Career Nod At Film, TV Awards". Billboard. Nielsen Business Media. 109 (21): 99. May 24, 1997. ISSN 0006-2510. Retrieved March 26, 2010. ↑ "Menken Honored at Film, TV Awards". Billboard. Nielsen Business Media. 110 (21): 96. May 23, 1998. ISSN 0006-2510. Retrieved March 26, 2010. ↑ "BMI Film/TV Awards: 1999". Broadcast Music Incorporated. January 1, 1999. Retrieved March 26, 2010. ↑ "BMI Honors Top Film and TV Composers". Broadcast Music Incorporated. May 15, 2000. Retrieved March 26, 2010. ↑ "TV and Film Composers Score at BMI Awards". Broadcast Music Incorporated. May 16, 2001. Retrieved March 26, 2010. ↑ "Top TV Shows For 1999-2000 Season". Variety. August 6, 2000. Retrieved March 22, 2010. ↑ "How did your favorite show rate?". USA Today. May 28, 2002. Retrieved March 22, 2010. ↑ "ClassicTVHits.com: TV Ratings > 1990's". Retrieved 6 October 2014. ↑ "The Final Countdown". Entertainment Weekly. May 29, 1998. ↑ "'Elv1s,' in 2nd week, rolls over Stones disc". Variety. ↑ "The Bitter End". Entertainment Weekly. June 1, 2001. ↑ "Rank And File". Entertainment Weekly. June 6, 2003. ↑ "In the Words of Angels: Twenty Inspiring Stories from Touched By An Angel". Amazon.com. Retrieved March 22, 2010. ↑ "Touched by an Angel: The Album [Soundtrack]". Amazon.com. Retrieved March 22, 2010. ↑ "Touched By an Angel: Christmas Album [Soundtrack]". Amazon.com. Retrieved March 22, 2010. ↑ "Touched by an Angel - 'Inspiration Collection' Releases Bring the Best Hope and Holiday Episodes to DVD". ↑ "Touched by an Angel - Update About Love and Faith DVDs: New Extras, Box Art, More!". ↑ "Touched by an Angel". Retrieved 6 October 2014.